Anywhoo, on to the food. Seeing as I was at home I thought this would be the perfect opportunity to try out butter chicken accompanied by home-made naan (stay tuned for that in the next post, but let me just say it was freakin' amazing!). You see I needed time for the chicken to marinade for an hour. Time I normally do not have on a weeknight. Yes, technically you could apply the marinade in the morning to be ready for cooking straight after work, but the not-so-organised girl inside me knew that wouldn't be happening. To the organised people out there - this is actually the perfect weeknight meal if you've already done the marinating legwork. After that the dish comes together in about 30 minutes. Adapted from Some More Please! 1. Mix marinade ingredients together to form a paste, rub into chicken, cover and refrigerate for an hour to let the flavours soak in. 2. Heat oil and butter in a large saucepan. Add chicken and brown over high heat. Remove chicken and set aside. 3. Add the onions to the same pan and fry over medium heat for 3 - 5 minutes until soft. Add garlic, ginger, salt, sugar and tomato paste and cook for another minute, then add water. Increase heat until sauce starts to boil, then decrease heat and simmer, covered for 10 minutes. Sauce should start to thicken. 4. Add cream and chicken, cover again and simmer for another 10 - 15 minutes until chicken is cooked through. Serve with naan or steamed basmati rice. * I didn't have ghee, so used butter instead. If you have ghee, by all means use it. But I figured, hey, it's called butter chicken, so I'm sure a little butter won't hurt. Right? 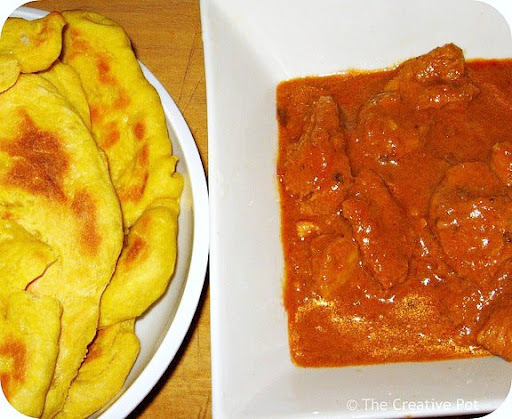 I have never had butter chicken... it should try it, it sounds delicious! You really should Karine, it's very tasty! I had a Chicken Tikka Massala (UK equivalent to Butter Chicken) from Tesco (supermarket) today and it was awful. Yours looks and must taste so much nicer. This looks fabulous! I am excited to try this naan recipe, too. I've recently become rather addicted to butter chicken, but I want to cut the fat more than half fat cream :P Make my habit as guilt free as possible. A lot of indian foot uses yogurt, so I was wondering if I could substitute the cream with that? Thoughts? Anonymous (re subbing yogurt) - You can definitely sub the cream with yogurt, although you might want to add a little sugar to combat the slightly sour flavour. Also take care to not heat the chicken too much after adding the yogurt or it could curdle.